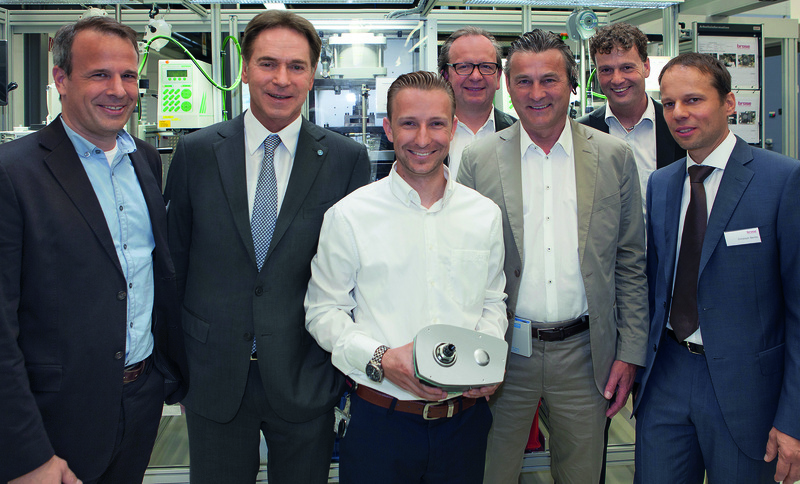 The international automotive supplier Brose celebrated the series production start of a new electric motor for e-bikes at its Berlin plant on Tuesday in the presence of guests from government and industry. This makes the mechatronics specialist the only supplier to offer a drive system "Made in Germany". The first customers include Bulls and Pegasus (both ZEG) and Rotwild. Brose has invested 3.4 million euros in the set-up of production capacities. technology and quality, and then gradually enter the classes below. The expectations are high and encouraged the other shareholders and me to take this step and create the necessary technical and personnel conditions," explained Stoschek. Brose's engineers have developed an innovative drive system for e-bikes over the last three years based on its steering motor for vehicles that has already been produced millions of times. Similar to the development of cars, the mature product has been extensively tested in laboratories and undergone intensive endurance driving tests under extreme conditions in the Alps, covering more than 100,000 kilometers since July 2013.
production of the e-bike drives. Moreover, permanent monitoring of the assembly processes and end-of-line testing of all motors ensure maximum quality for customers. bicycle frame. The batteries are supplied by BMZ GmbH Karlstein, Europe's largest battery manufacturer and a partner with whom Brose also collaborates to ensure the service for bicycle dealers. Weighing just 3.4 kg and generating up to 600 watts of power, Brose's mid-motor features a previously unheard-of power density. This advantage is obtained through the use of weight-reduced, yet higher-strength materials. Its compact design and flexible installation positions enable manufacturers to develop products with superior geometry, balanced weight distribution and agile driving behavior. Thanks to the design, standardized single or multiple chainrings and hence common groupsets can be used. It is possible to integrate the drive and battery into the frame depending on the customer's requirements and individually adjust the housing covers, providing bike designers with plenty of creative freedom. The driving behavior can also be customized: for instance, the delay in pedal assistance activation and intensity can be varied depending on the model. "We are convinced that e-bikes will gain increasing acceptance both as exercise equipment and means of transport in our daily lives. Whether in mountain bikes, trekking or cross bikes – we offer ideal system solutions for manufacturers who strive for maximum individuality and top quality," said Christoph Bantle, Vice President Product Group E-Bike Brose Group. "Our motor runs virtually silent and vibration-free. The highly sensible sensor system ensures smooth, yet powerful pedal assistance, thus addressing different target groups. In May this year, the premium bicycle manufacturer Rotwild presented the versatile All Mountain R.Q1 e-bike fitted with a compact mid-motor supplied by the mechatronics specialist Brose. The battery is fully integrated in the supporting framework, enabling the R.Q1 to retain its individual appearance and sporty handling, even in the hybrid version. The mountain bike with Brose drive will be available this fall. At the same time, Brose will start supplying Bulls and Pegasus models (both ZEG). Negotiations are underway with other manufacturers.